Only the northbound side, which is an old truckstop, is an official service area, although there is also a hotel on the southbound side. Overnight HGV parking costs £15 per night. The site is widely known as Kate's Cabin, after the truckstop and café here which opened in the 1930s. 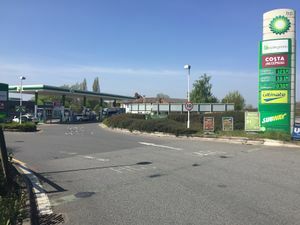 In the late 2000s, the filling station was rebuilt in order to enlarge it, and in late 2015, was sold by BP to an independent dealer, who introduced a Spar store and Subway to the site. In late 2017 it was sold to Applegreen. On the opposite side of the road was the Alwalton Little ChefHistory and a Travelodgebook. Although they weren't signed as services, it's worth noting that it was one of the oldest Little Chefs in the country, even if it was rebuilt in 1986 in its more familiar brick styling. At the same time a new Little Chef Lodge opened, which is now the Travelodge. The old restaurant was in the middle of today's car park, and there was a small, abandoned petrol station there too. 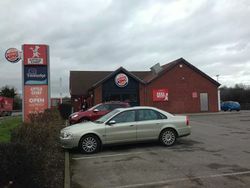 The building gained a Burger King in 1998, but the Little Chef had to become an EG Diner in January 2018. Both this and the Burger King closed on 23 May 2018. There are currently no known plans for this building, but the Travelodge is still open.